Instant graphs, showing exactly the rise of tide that is predicted at any chosen date, time and port. 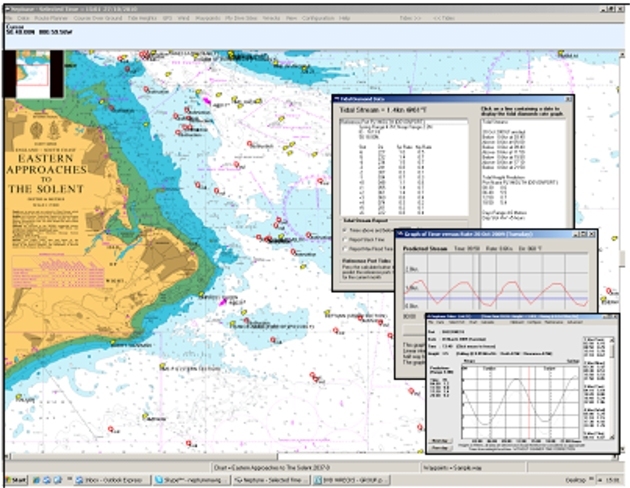 The software provides a dynamic tidal stream atlas instantly updating and producing Slack, Flood and Intermediate reports for optimising dive times. Details of thousands of UK Wrecks and Obstructions are available with details of depths, history, cargo and many other details ideal for planning dives. To assist with SOLAS compliance passage planning routines are included. Charts and tidal data are provided by the United Kingdom Hydrographic Office. Record details of your dive sites, also included is an Image Viewer for your photographs. The program manual is in HTML format.